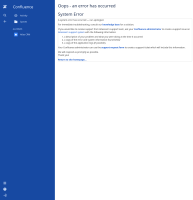 [CONFCLOUD-65396] Error evaluating Connect *_contains_any_user_group conditions - Create and track feature requests for Atlassian products. Connect app UI elements with the addon_property_contains_any_user_group, space_property_contains_any_user_group or content_property_contains_any_user_group conditions fail to display. Install a Connect app providing a UI element using one of the broken conditions. Navigate to the appropriate place in the UI. The condition is evaluated and returns true or false. An exception is thrown. A generic error is displayed. Currently there is no known workaround for this behavior. A workaround will be added here when available.